Finnish people believe that Santa Claus or Father Christmas lives in the north part of Finland called Korvatunturi (or Lapland), north of the Arctic Circle. People from all over the world send letters to Santa Claus in Finland. There is a big tourist theme park called 'Christmas Land' in the north of Finland, near to where they say that Father Christmas lives. It means that Santa doesn't have far to travel on Christmas Eve to deliver presents to people in Finland! If he doesn't get a chance to deliver the presents personally, he will often leave them under the Christmas Tree. In Finland, Santa might also be known as Joulupukki! (This really means 'Christmas Goat' as it was traditional in Finland that there was a Yule Goat who was scary and asked people for presents - and certainly didn't give any out! Over time the goat became the gift giver and then Santa took over the gift giving duties but the name of the Christmas Goat was still retained in Finland!) Joulupukki rides with reindeer leaves gifts under the Christmas tree but if you have been naughty you could end up with a bag of coal! In Finnish Happy/Merry Christmas is 'Hyvää joulua'. In North-Sami, spoken in northern parts of Norway, Sweden, Finland and Russia, it's 'Buorit Juovllat'.Happy/Merry Christmas in lots more languages. Animals are given their own Christmas in Finland, with farmers sometimes hanging a sheaf of wheat on a tree to be eaten and pecked at by the birds. Nuts and pieces of suet are also hung on trees in bags from the branches. Everyone cleans their houses ready for the three holy days of Christmas - Christmas Eve, Christmas Day, and Boxing Day. On Christmas Eve, or the day before, Christmas trees are bought from the local market or square. The seller expects you to bargain with them on the price. Christmas Eve is very special and the most important day over Christmas. It's traditional to eat rice porridge and plum fruit juice for breakfast. Then the tree is bought (if it hasn't been already) and is decorated. At midday, the 'peace of Christmas' is broadcast on radio and TV by the City Mayor of Turku (which is south Finland). 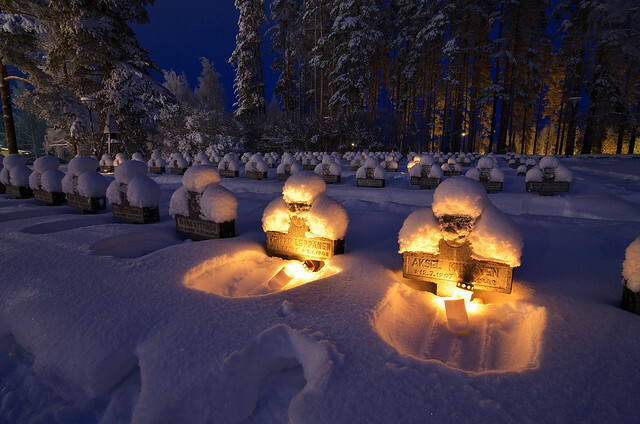 Because it gets dark very in most parts of Finland around Christmas (about 3.00pm) it's now traditional to go cemeteries and visit the graves of family members. Some cemeteries are enormous and police are on duty to manage the traffic, but everyone must walk the last few yards to the grave. Candles in hanging lanterns are left around the grave, often lots of family members go. The whole cemetery is alight with glowing lanterns shining in the snow - a winter wonderland. Other people like a sauna on Christmas Eve. The main Christmas meal is eaten in the early evening. Lutefish (salt fish) is the traditional starter, but is not so common nowadays. The main meal is a leg of pork served with mashed potato traditionally baked slowly in birch-bark boxes in the oven with similarly cooked mashed swede. Casseroles containing different vegetables including, rutabaga, carrot and potato are also common. Cured salmon is very popular and some people also have turkey. Desert is baked rice pudding/porridge eaten with spiced plum jam. One almond is hidden in the pudding. Whoever find the almond will be lucky for the next year. After the meal, Joulupukki (Santa) might visit the house! When he comes in with his sack he asks if any children are living there. They reply very loudly! Next then asks if they have been good all through the year. When they are given their presents the whole family gathers to watch the fun of opening. After opening some presents, it's time to go to bed - but some people like to stay up all night to see Christmas Day arrive! Christmas Day is much quieter with families usually spending it quietly at home. On Boxing Day people like to go out. Skiing is popular along the flat terrain or skating if the lake or river has frozen.